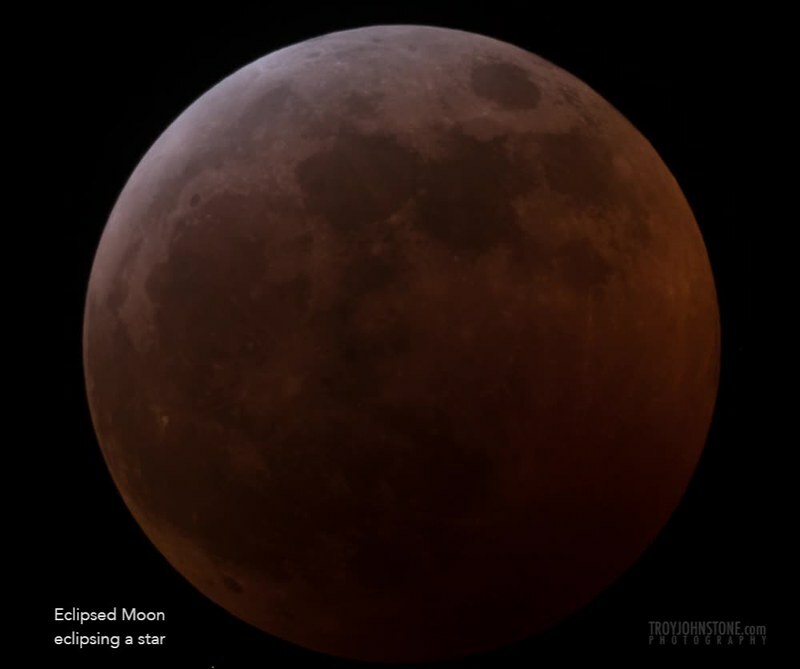 On January 20th, 2019, we enjoyed a total lunar eclipse during a so-called supermoon, meaning the Moon was closer to the Earth and therefor spent more time in the shadow. At the distance from the Earth to the Moon, the Earth’s shadow is approximately 2.6 lunar diameters, or around 9,000 km wide. The photo above has three images taken about an hour apart. Reviewing my photos of the eclipse, I realized I had captured double eclipse. Technically called an occultation of a star, the Moon passes in front of a magnitude 8.5 star called SAO 97665, just before the deepest part of the eclipse. You can see it in the lower left. One photo every 20 seconds. Best viewed full size. I like this photo as it shows the Moon just coming out of totality with the bottom right still a deep red, but the upper left being lit with some of the blue light scatter coming through our atmosphere and a thin sliver of direct sunlight on the edge. These are some of the best moon pics I have ever seen. It reflects the work of a knowledgeable technician and sensitive artist. Thanks for doing what you do. I’ll have to return often to see what you are up to.